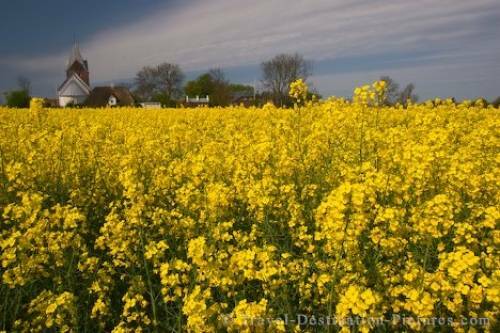 A sight to lighten any mood, yellow canola flowers blooming prolifically in a field in Jutland, Denmark. Driving through the flat landscape of Jutland in Denmark you very often stumble across the yellow patches of Canola fields. These oil-rich plant is more and more used to manufacture bio diesel for traffice purposes. However, the intensive colour of the fileds makes for good views contrasting with the wide blue sky. in a field in Jutland, Denmark.